Teacher Priscilla Joseph (left)) and paraprofessional Ketura Noel prepared for language class. When Priscilla Joseph was growing up here, she had no formal opportunities in school to learn Haitian Creole, her family’s cultural language. Instead, she picked up words from listening to her family speak it. Eventually she and her friends began conversing among themselves, and later on she acquired more of the language by traveling to her mother’s homeland. Now, Joseph is hoping to transfer her own natural curiosity about her family’s language and heritage to the students in her preschool classroom at the Mattapan Early Elementary School, where she will be the lead teacher in the Boston school system’s first dual-language program in Haitian Creole. “I think this will be a great opportunity to help students maintain their language,” Joseph said. The program, which allows both native and non-native speakers to learn in English and Creole, will be one of the few nationwide, joining schools in Miami and New York. Haitian Creole is the third most commonly spoken language among Boston public school students, following English and Spanish, according to school officials. The first day of school in Boston is Thursday, although kindergarten and preschool programs, including the Creole program at the Mattapan school, won’t start until Monday. Boston is embarking on the new program as school systems statewide are struggling to educate students who lack fluency in English. For years, advocates for linguistic minorities and many parents have been pushing school systems to create more dual-language programs to help these students. Dual-language programs are one of the few exemptions allowed under a 15-year-old law that requires schools to teach all subjects to non-native speakers in English, regardless of whether they can speak the language. Up until now, though, Boston has run only five dual-language programs — all of them in Spanish. Yet a growing body of research has shown that English-language learners in dual-language programs tend to achieve at higher rates than those in segregated programs, such as when students are taught only in their native language or just in English, as is the case in Massachusetts. For instance, a 2012 study by researchers Wayne Thomas and Virginia Collier found that non-native English speakers in dual-language programs can fully close the achievement gaps with their fluent peers and in some cases can even leap ahead of them. Superintendent Tommy Chang said he hopes to create additional programs in the coming years. He said the creation of the Creole program has taken on even more significance since President Trump announced earlier this week his intent to abolish a federal policy that has shielded young immigrants brought here illegally from deportation. “While our president’s message to the world is that we are not embracing all people who come to this country, the message in Boston is different: We are a school district that welcomes students from 139 countries,” Chang said. For Chang, the issue of maintaining one’s cultural language is personal. He came to the United States as a child, speaking Taiwanese and Mandarin. But as he became immersed in English, his knowledge of his two other languages didn’t grow, and he regrets that he is not as fluent in his cultural languages as he would like to be. Edyne Lalanne jumped at the chance to sign up her 4-year-old daughter for the program. Both she and her husband are Haitian-Americans who were born in this country and want their daughter to know her heritage. Michel DeGraff, a linguistics professor at the Massachusetts Institute of Technology and the director of the MIT-Haiti Initiative, said Boston’s decision to launch a dual-language program in Creole is “very bold” because the use of Creole in Haitian schools is controversial, even though it is the language almost all Haitians speak. Creole was once looked down on in Haiti as a peasant language, and most schools there have long delivered instruction in French, which harkens back to the country’s colonization by France. French has been, by and large, the language of the ruling class. But an effort is underway in Haiti — endorsed by its education ministry — to bring Creole into all levels of schooling as a way to make education accessible to all children. That, in turn, has spurred an exhaustive effort in Haiti to produce reams of books and other materials in Creole. The MIT-Haiti Initiative is helping to create those materials and is conducting research that has shown students are learning to read three times faster in Creole than those learning in French. The newness of Creole in Haitian schools created one of the biggest obstacles for Boston as it attempted to find materials that would meet the rigorous academic standards that Massachusetts has set for its own schools. Consequently, teachers and administrators at the Mattapan school as well as staff from the Office of English Language Learners had to write many aspects of the curriculum. 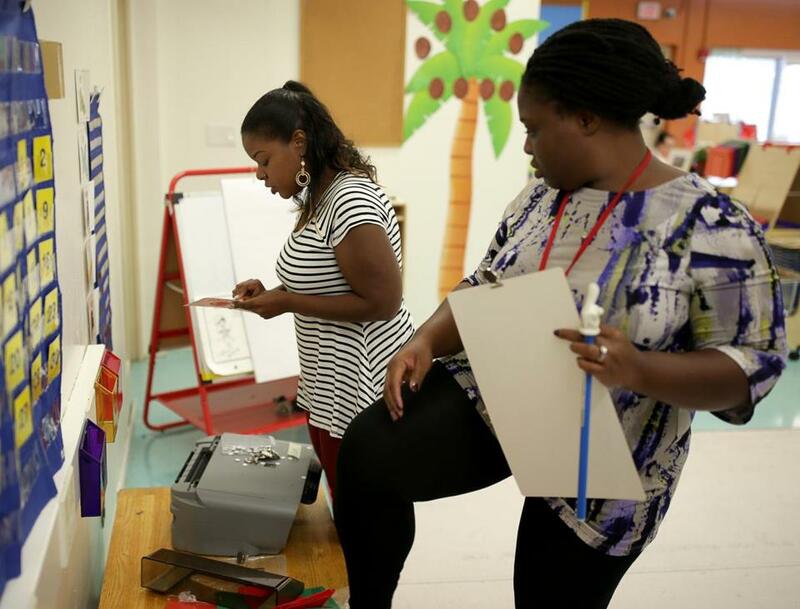 The Mattapan program is starting small, with a single class of 25 preschoolers. Many have come from Haiti, as recently as this summer. Others were born here and have had exposure to the language. Several don’t know the language at all. The program will expand to upper grade levels as this group of students move up each year. On Tuesday, as freshly painted walls glimmered in the sunlight, Joseph, her assistant teacher, Ketura Noel, and others were beginning the time-consuming task of setting up her classroom for the new year. Pictures of Haitian artists adorned the walls. Soon, they would be joined by the letters of the Haitian alphabet and laminated signs were ready to be hung identifying items, such as clocks, light switches, and books, in Creole. One of the first words the students will learn is “byenveni” — welcome in Creole. While other classrooms at the school, which expects to have more than 300 students this year, won’t have a dual-language program, the school plans to integrate Haitian culture and language throughout the building, introducing various words in Creole to the entire student population.